Bob Tisdale doesn't believe "manmade-global-warming dogma"
One of the climate science community’s primary problems was a very basic message…an intentionally misleading message. That is, it wasn’t how it was communicated; it was the message itself. Bob takes issue with scientists because they take it as a given that humans are causing global warming. Even after all this time Bob can't accept the physics of the greenhouse effect. Bob thinks it is "intentionally misleading" to accept that there is a greenhouse effect caused by particular gases in the atmosphere, which keeps Earth warm. What would have happened if we hadn't been adding greenhouse gases to the air? As if to prove his point that he can't accept the physics, Bob posted a whole bunch of charts and text from the AR4 and AR5 IPCC reports demonstrating that without anthropogenic influences (an increase in well-mixed greenhouse gases) surface temperatures would not have risen. Instead of sitting back and saying "hmm...that makes sense" like any normal sane person, Bob says it shows no such thing. Bob reckons it doesn't prove that humans have raised global temperatures. Bob isn't disputing the warming. Strangely, it's not that he thinks that the scientists have missed a gigantic "natural" forcing either. What he seems to be arguing instead is that models can't model natural variation and there is some "oscillation" that the models are missing. In other words, Bob believes the world is warming by magic. That this warming is "natural" and unforced. Bob hasn't said so specifically (or not that I could find), but the natural conclusion is that Bob thinks it will cool down when this sudden, new "oscillation" has run its course. Bob doesn't explain why his oscillation has never been seen before - at least not in the past 20,000 years. He doesn't explain why his "oscillation" first appeared with the rapid rise of well-mixed greenhouse gases. Nor does he say when his "oscillation" will peak and go into the down-swing. It is "natural" - Bob disputes the greenhouse effect. He doesn't accept the underlying physics. He refuses to believe that CO2 keeps Earth warm and more makes it warmer. It is an "oscillation" - Bob's "oscillation" is only one way. It never actually oscillates it only goes up and up and up. It only gets hotter but never cooler. It's caused by ocean warming - from unstated causes. Unfortunately for the IPCC, the models they show with only natural forcings (the blue curves) do not present natural variability. The climate models employed by the IPCC cannot simulate naturally occurring, coupled, ocean-atmosphere processes that cause multidecadal variations in surface temperatures. Which "oscillation" caused warming of the past few decades? Now at this point at least one of his readers should be scratching her head and asking which "naturally occurring multidecadal oscillation" is causing temperatures to keep on rising. It must be a very, very long oscillation because otherwise surface temperatures would be back to those of whatever is the period of the oscillation. If an oscillation lasted 30 years, then every 30 years the temperature would be the same. If the oscillation is 100 years, then surface temperatures today would be what they were 100 years ago. So, this is a very lo...o...o...ng oscillation - at least a hundred years long for half the oscillation - and it hasn't yet peaked let alone "oscillated". 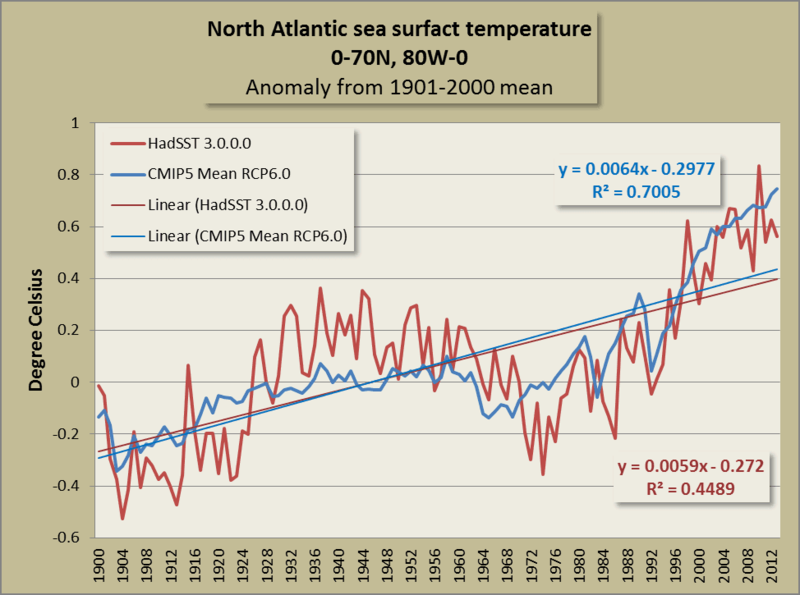 Of course sea surface temperatures are "capable of varying" over time. Does he think no-one but him has noticed that fact? 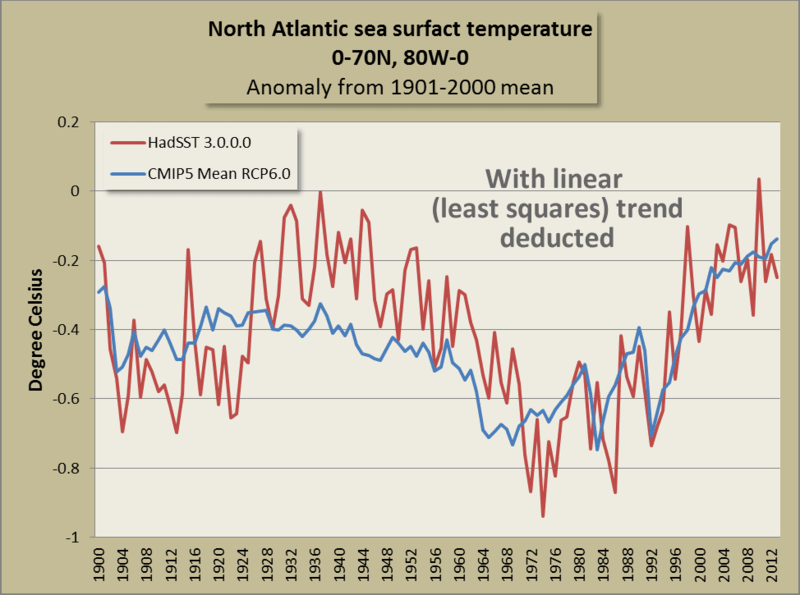 Bob didn't have to remove a linear trend to show that sea surface temperatures can vary. If it was the linear trend he removed then any variation from the linear trend is, well, a variation from a linear trend. Nor has he made any startling new discovery. Scientists, as well as you and me, know that there are longer and shorter ups and downs in sea surface temperatures. ENSO is a good example of a intra-decadal oscillation. The surface temperature of the Pacific in different parts, for example, fluctuates over more than one decade. Not necessarily to any particular regular time frame - but it does get warmer and cooler in different parts over time. The climate system consists of many natural cycles operating on differing timescales, and in combination they result in short-term natural variability. These can work to lower, or raise, the global mean surface temperature through heat uptake or release from the oceans, among other processes. There is a lot of uncertainty associated with these cycles that carries through to model representations and projections. Did Bob think that part of the message was okay? I guess he did. I sometimes wonder if Bob is assuming that global warming is linear everywhere always, including in the North Pacific and North Atlantic. I'd have thought he would know that water moves about for one thing. It moves up-down-north-south-east and west and everything in between, depending on ocean currents and surface winds. When it moves it carries the heat with it. I've dashed off a chart of one of the areas he plotted, showing the sea surface temperature anomaly from the twentieth century average using HadSST 3.0.0.0 and CMIP5 tas mean (sea only) for RCP6 (that was the pathway that Bob chose, but I don't think it would make much difference which one). Both charts demonstrate that the CMIP5 ensemble is much closer to the observations from the seventies to now (2013). One thing that Bob is assuming (I think) - erroneously, is that by removing the linear trend he is left with only natural forcings. Now that's odd on one count and wrong on another. It's odd if he thinks that. It's odd - because he doesn't "believe" that warming is anything other than natural. That is, he doesn't accept the greenhouse effect is real. It's wrong because humans also created smog and lots of aerosols, which can cause cooling. So by only removing the linear trend what remains is not necessarily all "natural". Nor is the linear trend itself necessarily all from greenhouse gases. In the early part of last century, for example, there was solar forcing that contributed to the rise in global temperatures. What is the bet that the error in observations of sea surface temperature is much less since the 1970s, too? I mean, how do I know which would be a more accurate reflection of what actually happened between 1900 and 1980 in regard to sea surface temperatures, the model ensemble mean or the observations? Prior to the 1980s measurements of sea surface temperature were derived from instruments on shorelines, ships and buoys. The first automated method of gathering sst was by measuring water flowing through the input ports of ocean faring ships. While this method obtained a significant quantity of useful SST data there were some shortcomings. The depth of the input ports of different ships can vary greatly from ship to ship. In a stratified ocean these different depths can have different temperatures. This method also resulted in rigorous sampling along major shipping routes but a dearth of information about the vast majority of the world's oceans. Since the 1980's most of the information about global SST has come from satellite observations. Instruments like the Moderate Resolution Imaging Spectroradiometer on board (MODIS) onboard NASA’s Terra and Aqua satellites orbit the Earth approximately 14 times per day, enabling it to gathering more SST data in 3 months than all other combined SST measurements taken before the advent of satellites. I, Bob Tisdale, don't believe the physics of the greenhouse effect but I accept the world is warming. Probably by magical spells being cast in the ocean. Bob's articles attract the sort of WUWT-er who doesn't understand a word he writes but is happy to be given the chance to say their piece, whatever that may be. Philip Haddad says that it's not the CO2 that's causing the warming, it's all that burning in nuclear plants! ...Wait! I know, I know, call on me! How about not presenting a “message” at all since that is not the job of a scientist, it is the job of a political demagogue or religious leader? Sou many years ago I was learning how to fly. Quite late in the thirty odd hours that are required to make you fairly safe, the instructor will make you fly only on instruments. This is to show that you cannot do it without extensive training. They put this plastic hood on your head so you cannot see outside to get cues from the real world. I had successfully completed some manoeuvres purely on instruments when the instructor asked me to turn on a heading and climb to 8000ft. We were now in thick cloud. He had me do quite a few turns and climbs and finally asked 'do you think you can do a steep turn for 180 degrees without gaining or losing height.' I cranked the aircraft into a 60 degree turn and held altitude all the way. He was shocked. He asked how are you doing that? My answer was simple. I merely cross correlated all the information in front of me. It is not enough to look at one measure how the aircraft is fairing. To fly blind on instruments was easy for me as I had analysed data for many years. This is a skill that is lacking among the deniers. They will choose an instrument they 'like' and use this sole instrument to then go to the crash site! I am a pilot myself, so understand what you mean, particularly flying limited panel, without the attitude indicator. Without that primary instrument, you have to rely on the compass, altimeter, turn rate needle and skid ball. Following any one of which exclusively will lead to disaster, but all together a benign outcome. I will use that analogy, when arguing against my skeptical friends, especially with the 'it hasn't, warmed for X years meme'. Concentrating on surface temperatures is a bit like looking at the compass without checking the altimeter. "It is "natural" - Bob disputes the greenhouse effect. He doesn't accept the underlying physics." I know that there's an argument to be made that Bob rejects the logical implications of a GHE from ACO2 - but I am curious if you have evidence whether he has actually argued about the physics itself - and in particular whether he has pointed to what he considers a basic flaw in the basic GHE from ACO2 theory? I ask this because some might consider that Bob is a "leading 'skeptic'" and argue that "leading 'skeptics'" are mostly all "lukewarmers" who don't doubt the basic physics. For example, Judith Curry has said that she doesn't listen to (paraphrasing) anyone who doubts the basic physics, and that she doesn't know of anyone "in the room" (again not a direct quote - I'm paraphrasing) who doubts the basic physics of a GHE from ACO2, yet she has also been quite complimentary towards Bob's input into the climate wars. It seems to me that many "skeptics" like to hide behind the ambiguity of labels such as "skeptic" and "lukewarmer" - in ways that allow them to proclaim that they don't doubt the basic physics even as they make arguments that contradict the basic physics. In that way, self-described "luke-warmers" can throw the "skeptics" who actually have the stones to admit that they don't accept the physics under the bus - to make statements that hide contradictions about what "skeptics" do and don't believe (even as they argue that "skeptics" are not monolithic). But is Bob really one of those who argue against the basic physics? I figure Judith would want to know - 'cause then she'd have to stop listening to Bob. I've had a poke around and I find lots of occasions when BT says "modern warming is not caused by GHGs" but nowhere where he explains why the calculated radiative forcing from increasing GHG concentrations is flawed. To me, this is essentially physics *denial*, even though he doesn't directly and specifically argue about the physics itself. He has a lot to say about the "models being wrong" but nothing really fundamental as to why. Just "it's not CO2". Yeah, that was my recollection. He doesn't discuss the physics. That way he can avoid the logical conflict between accepting the physics and saying that there is no impact to the climate from CO2 emissions. Of course, on the other hand, logical coherence is not particularly an obstacle for many "skeptics" anyway. My leitmotif is "intellectual dishonesty" much as yours is "motivated reasoning". We are 'very likely' scribbling on the back of the same napkin. instead of admitting the hypothesis of human-induced global warming is fatally flawed, they perpetuate a myth. the warming of the global oceans has been caused by Mother Nature, not anthropogenic greenhouse gases. When I get time I'll see if I can dig up some more categorical statements from Bob. He mostly handwaves it away. Debunker when I use this analogy deniers say that they do not know how to fly so it is meaningless to them. I then point out they know about as much about flying as they do about climate science. It takes far longer to become a competent climate scientist than it takes to learn how to fly a plane. I am only an amateur flyer. I can now do aerobatics in Pitt's Specials. This gives me a glimmering of what all professional air force and commercial jet pilots know.